No one likes to think their dog is in pain, but when you notice something isn't right and you fear your pet is suffering you will no doubt be keen to identify the problem as soon as possible to help . The primary symptom of arthritis in dogs is pain, but since it is usually a dull ache which gets worse only under specific conditions, your dog isn't likely to whimper or cry. Altered gait. This is usually the first sign. Your dog will walk with a limp as he tries to reduce movement of the affected joint. During the early stage of osteoarthritis, you may only see this sign fleetingly; often when he first walks after resting for some time (like in the morning) or possibly after relatively strenuous activity. Reduced range of activities. Your pet will show increasing reluctance to do some activities that he had no trouble with before such as jumping down from the couch, climbing down stairs or getting into the car. He may even be reluctant to go for a walk. Changes in limb muscle. If osteoarthritis strikes one joint or the joints of one limb, your pet will compensate with the other limbs. This will result in reduced muscle mass in the affected limb while the other limbs’ muscles could get bigger. Look for a difference in size between corresponding limbs. Loss of appetite. Even mild pain can upset one’s appetite. It happens to us humans; it can occur in your dog as well. If your dog starts turning his nose up at his dinner bowl when he once would have eaten anything you put in it, look for a reason for his disinterest in food. Sometimes the solution can be as simple as to elevate their food bowl with a dog bowl stand. Lack of interest in favourite activities. You may notice that your dog doesn’t want to chase his ball down the back yard, or wrestle with his canine playmate. No matter how much he enjoys these activities, pain will take a lot of the pleasure out of them. Biting at the sore spot. If your dog has sore hips, you may notice him biting at his rump. Similarly, a sore wrist will see him nibbling at his front legs. Your first thought may be that he has fleas or an allergy, but don’t rule out pain as the cause of this behaviour. Withdrawal from your family. 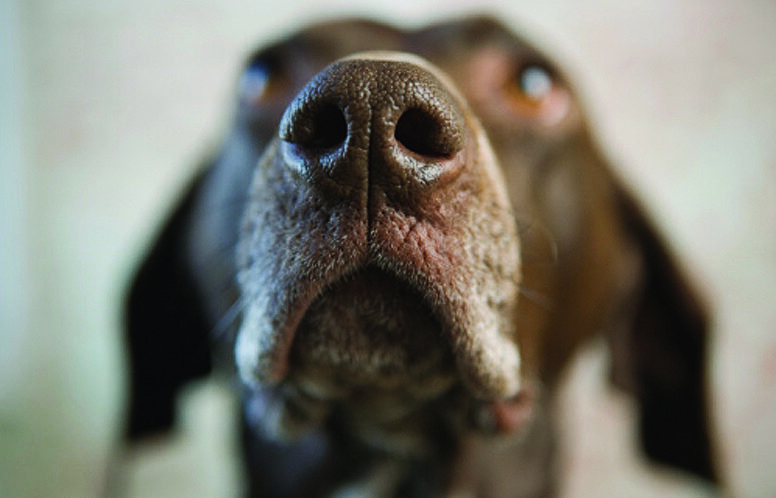 Your dog may get sore when he is bumped or nudged and if so, he may stay away from you to avoid that pain. For example, he may no longer lie under the table at dinnertime, in case of an accidental encounter with a foot or he may be reluctant to join in a family game of football. It’s not hard to notice your dog limping but the behavioural changes associated with arthritis are less obvious. If you’re observant, you’ll notice at least one of these changes and recognise that he needs veterinary attention. Keep an eye on him as he ages so you can have any joint pain treated as soon as it appears.